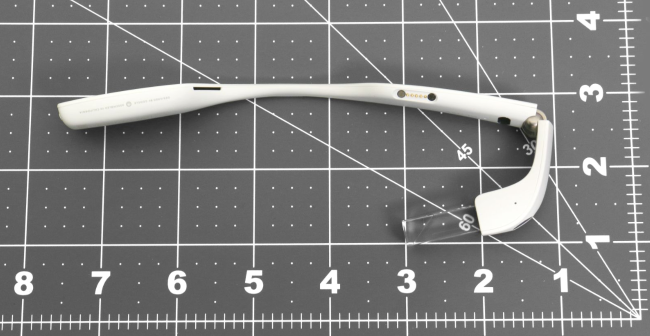 High-resolution images of Google's revamped Glass wearable have cropped up in an FCC filing published on Monday, likely indicating that a production model isn't too far out. While the headgear does share some similarities to the consumer-minded Explorer Edition we're all familiar with, there are enough differences to make it noteworthy. The most obvious changes include a larger prism that can be adjusted both vertically and horizontally and a hinge allowing it to fold like a traditional pair of glasses. A report from The Wall Street Journal (corroborated by other publications) claims the augmented reality visor will be powered by a newer Intel Atom processor that'll increase battery life by as much as two hours. Better Wi-Fi is also said to be in the cards, as is a magnetically-attachable external battery pack. Unfortunately, the external battery wasn't shown in the FCC filing. The headset in question is rumored to be one of several iterations in development under the Project Aura banner (not to be confused with Project Ara, the modular smartphone initiative) with help from Amazon's Lab126 hardware division. This particular iteration could be limited to Glass for Work distribution meaning you won't be able to go out and buy one for everyday use. The original Google Glass, codenamed Project Glass, was all the rage when it was unveiled in April 2012. The search giant had no problems selling the device to developers at $1,500 a pop but it was unforeseen privacy concerns that forced the company to end its Explorer program and rethink Glass' reason for being.